Inbound and outbound flights from US and Europe for Delhi are being re-routed through Ahmedabad and Mumbai, tweeted Air India. 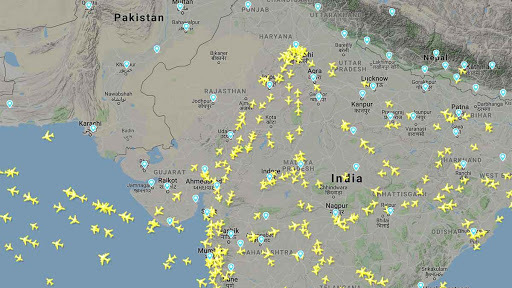 New Delhi: Various airlines such as Air India, Jet Airways, Qatar Airways and Singapore Airlines Wednesday announced they were rerouting their flights as Pakistan closed its airspace in the wake of escalating tensions with India. “Inbound and Outbound flights from USA and Europe for Delhi are being re-routed through Ahmedabad and Mumbai. Flights landing into India from USA and Europe are being re-routed via Dubai and Sharjah and will land into India with a delay,” Air India tweeted Wednesday evening. The national carrier, however, added “no flights are cancelled and there will only be an increase in the flying time”. Pakistan Wednesday closed its airspace for commercial flights and suspended flight operations across major airports, including in Islamabad, Lahore and Karachi, for an indefinite period in the wake of the escalating tensions with India. Pakistan’s Civil Aviation Authority made the announcement after the director general of Inter-Services Public Relations, the military’s media arm, acknowledged the closure of Pakistan’s airspace due to the prevailing security situation. In India, the Jet Airways sought relaxation in flight duty and rest-hour norms from the country’s aviation watchdog the Directorate General of Civil Aviation (DGCA) due to the closure of the Pakistani airspace and subsequent re-routing of the West-bound flights. The dispensation has been sought as the flights, which were earlier using the Pakistani airspace, will now have to be operated over the sea, entailing higher flying time than the regular routes, sources said. “Due to the escalation of tension along the western border, the Pakistani airspace has been closed. In view of this, we have to reroute flights South of Pakistan FIR (flight information region) leading to increase in flight and flight duty times,” Jet Airways vice-president for operations Floyd Gracious said in a communication to the airline pilots. An FIR refers to specified airspace where flight information and alerting services are provided. Generally, an FIR can be land and sea territory as well as any international airspace as defined under global norms. “We have requested the DGCA for some special dispensation due to this sudden development keeping in view least discomfort to travelling guests,” he said. Both pilots and cabin crew are governed by DGCA-mandated flight duty and time limitation (FDTL) norms, but a special dispensation allow the crew to do additional duties and night landings as well. The Singapore Airlines said due to the airspace closure by Pakistan, two of its Singapore to London flights – SQ308 and SQ318 – will stop for re-fuelling at Dubai and Mumbai, respectively on February 27. It said the Singapore-Frankfurt flight SQ318 will stop at Mumbai for re-fuelling on February 27 “provided it is able to arrive in Frankfurt before the airport’s curfew”. “All other flights that overfly affected airspace will be rerouted, but are due to operate as scheduled at this point,” the airline added. Qatar Airways also stated that it was re-routing its flights due to the airspace closure. “Qatar Airways can confirm that due to the ongoing situation on the India-Pakistan border, its flights to the following airports are currently temporarily suspended: Faisalabad, Islamabad, Karachi, Lahore, Multan, Peshawar and Sialkot,” the airline said. “Other flights routed over India-Pakistan aerospace may also experience delays due to rerouting around the affected area,” it said. British Airways said it was closely monitoring the situation and its flight plans varied “frequently” depending on a number of factors. “But our highest and first priority is always the safety of our customers and crew,” it said. The Airports Authority of India (AAI) manages over 100 airports across the country. The AAI earlier Wednesday issued a notice to airmen (NOTAM), saying flight operations at the airports in Srinagar, Jammu, Leh, Pathankot, Amritsar, Shimla, Kangra, Kullu Manali and Pithoragarh will remain shut from February 27 to May 27. However, the DGCA said operations at these nine airports have resumed “as of now”.